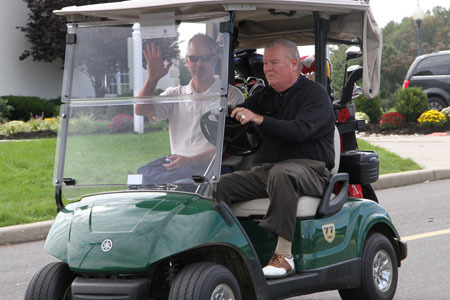 West Windsor, N.J. -- The clouds cleared out just in time for a great day of golf for 76 enthusiastic Mercer supporters. The 20th Annual Golf Classic, hosted by the MCCC Athletics Department, went off without a hitch at Mercer Oaks Golf Course on Oct 4. The event raised more than $10,000 for the MCCC Student Athlete Scholarship Fund. The tournament is held in memory of Dr. Cynthia Schaffer, who served on the MCCC Foundation Board and was deeply committed to youth sports. 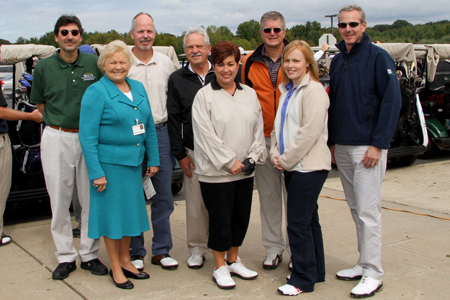 Prior to the shotgun start, MCCC President Patricia Donohue welcomed and thanked the assembled golfers. Pointing to the 16 student athletes who came out to assist at the tournament, she said, "You see here today representatives from our nine athletic teams. Virtually every year some of our teams are regional or district finalists, or advance to national tournaments. They represent Mercer with distinction and they couldn't do it without your support. So we thank you for being part of this effort." Athletics Director John Simone joined with Dr. Donohue to acknowledge the more than 30 generous sponsors who contributed to the proceeds total. He noted, "We see the life-changing impact of students' involvement in athletics. This is a cause well worth supporting." Following the tournament, guests joined together in the Mercer Oaks ballroom for a banquet. The celebration included the presentation of awards, as well as a silent auction of sports items and other valuables. Representing the MCCC Foundation Board was Chair E. Karen Kennedy, who expressed her appreciation to the assembled group for making MCCC athletes a special priority. Awards were announced by John Simone. The winning team included Chuck Herring, Harry Morrison and Rose Marie Morrison. Awards were also given for second place, longest drive, and closest-to-the-pin. Community members who participated on the Golf Tournament Committee included: Victoria Baldwin of The Bank, Doug Borden and Jeff Perlman of Borden Perlman Insurance Company, Dave Fraytak of Fraytak Veisz Hopkins Duthie, Tom Kull, Nina Melker of The Bank of Princeton, Scott Needham of Princeton Air Conditioning Inc., and Steve Ritzau. Many generous corporate and individual supporters contributed to the event. Major sponsors included: Architectural Window Manufacturing Corporation, Borden Perlman Insurance Company, Clayton Block Company Inc., Coryell Tree Service, Dave Fraytak, Honeywell, Fox Rothschild LLP, New Jersey Manufacturers Insurance Company, Spiezle Architectural Group Inc., and Tom Kull. Other key sponsors included 1st Westco Corporation, Clarke Caton Hintz, Edwards Engineering Group Inc., Fraytak Veisz Hopkins Duthie, P.C., Griffith Electric Supply Company, Hopewell Valley Community Bank, Kucker-Haney Paint Company, Lord Abbett, Mercer County Golf Academy, Merrill Lynch, Robert Wood Johnson University Hospital Hamilton, Roma Bank, Stark & Stark, Stout's Transportation, The Bank, and The Bank of Princeton. Other sponsors were Victoria Baldwin, The Haldeman Dealerships (Brian Bennett), Princeton Air Conditioning Inc., AAA Mid-Atlantic (Kevin Micsko), Security Dynamics (John DiVeronica), Jo Jo's Tavern, Randy Jones, Frank Lucchesi, Nina Melker and Mrs. G (Steve Ritzau). Last year, 127 Mercer students participated in athletic teams. Among the year's highlights were a national title for tennis player Alison Noll at no. 1 singles, a first for a Mercer woman, and a third place national finish for the men's tennis team, with doubles partners Travis McCaughan and Juan Ramirez winning the title at no. 2. The men's soccer team won the Region 19 championship and women's basketball won the Garden State Athletic Conference. Nine students were named All-Americans and three were named Academic All-Americans. The women's tennis team won an NJCAA All-Academic Team Award with a combined GPA of 3.42. Twenty-two student athletes transferred to continue their education at four-year colleges. At the tournament, from left, MCCC's Athletics Director John Simone and President Patricia Donohue with Golf Committee members Scott Needham, Dave Fraytak, Nina Melker, Steve Ritzau, Victoria Baldwin and Jeff Perlman. Not pictured: Tom Kull. MCCC athletes came out to greet participants and assist at the tournament. Ready, set, golf! Scott Needham, left, and Tim Losch head to the links. 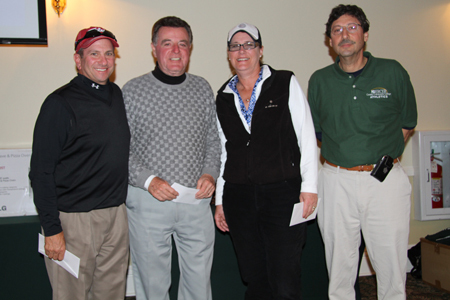 First place winners, from left, Chuck Herring, Harry Morrison and Rose Marie Morrison with MCCC's John Simone. 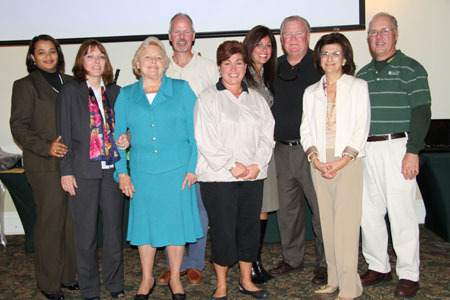 From left, MCCC VP for College Advancement Mellissia Zanjani, Foundation Board Chair E. Karen Kennedy, MCCC President Patricia C. Donohue, and Foundation Board members Scott Needham, Nina Melker, Melissa Tenzer, Timothy Losch, Vice Chair J. Lynn Cannon and Tom Kull.